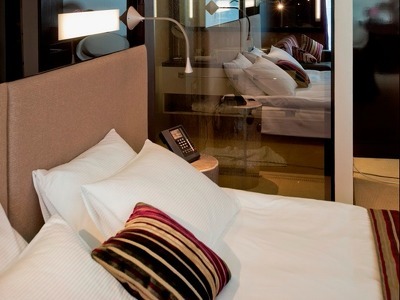 The 49 air-conditioned rooms at 11 Mirrors Design Hotel have an LCD TV with a great selection of channels and movies. The open bars are full of an eclectic drink selection and there is a personal laptop-sized safe. 1 king-size bed, sleeping, 2 people. The Courtyard Standard Room is ideal if you're looking for value as well as style. These rooms overlook the courtyard and the exceptionally stylish bathroom is designed as a transparent glass cube with a separate large walk-in shower for two people as well as an additional rain-air shower. The open bar has a great choice of drinks and the LCD TV has a great choice of channels. 1 king-size or twin beds, sleeping, 2 people. If you're looking for privacy and want to relax from the hustle and bustle of the city this room is a perfect choice. The windows overlook the historical part of Kyiv – Golden Gate, St. Sophia Cathedral and charming buildings from the 19th-century. The modern en-suite bathroom is designed as a transparent glass cube with a separate large walk-in shower for two people and additional rain-air shower. An open bar offers a refined selection of drinks. 1 king-size bed, sleeping, 2 people. Imagine a place where you can follow your passion, relax in a spa-inspired bathroom and enjoy one of the best nights sleep you'll ever have. As soon as you step into the room you'll soak up the city and its ancient heritage through wide floor-to-ceiling windows. This room features a working space with a modern glass table allowing you to catch up with work. Taking a treat with natural «Pure Herbs» cosmetics in the spacious walk-in shower before heading out to explore Kyiv. 1 king-size bed, sleeping, 2 people. If you're used to being one step ahead of the rest, then this is the room for you. Air and water are combined to provide balance and freedom within the room. 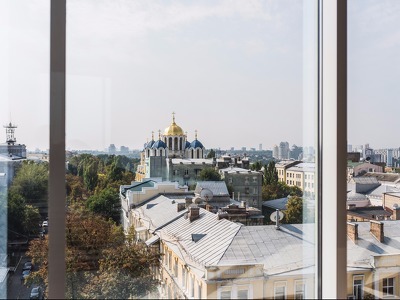 Wide panoramic windows open up a wonderful view onto Kyiv and its monuments. These rooms have spacious en-suite bathrooms with an oversized bathtub and a walk-in shower for two. 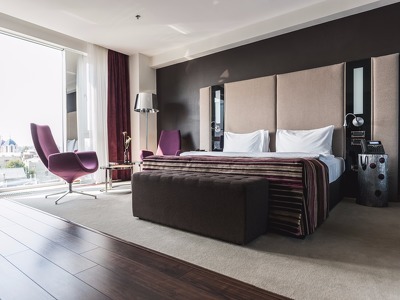 The 11 Mirrors Design Hotel is a 49 room contemporary hotel in the heart of Kyiv, the capital and largest city of Ukraine. 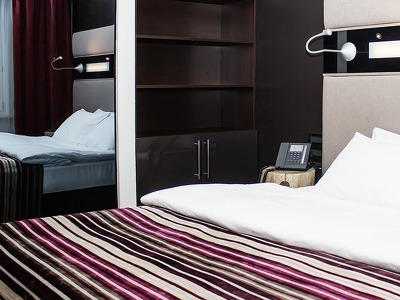 Just a few metres from the centre and the National Opera House this sophisticated hideaway is ideal if you're travelling for business or pleasure on your own or as a couple. Modern and striking interiors are matched by the excellent service. There are plenty of places and monuments to visit within easy reach of the hotel. The Golden Gate is a fortified monument which served as the main gate into the city. St Sophia Cathedral is a UNESCO World Heritage site and a world-famous architectural treasure from the 11th-century, it's also one of the most beautiful temples of Kyiv. It's worth popping in to the Pinchuk Art Centre, just 15 minute's walk from the hotel. This international centre of contemporary art is an open platform for new and world-renown artists. The 11 Mirrors restaurant is an elegant but informal dining experience on the mezzanine level. Breakfast is a continental buffet. The à la carte evening menu focuses on the best European dishes or if you prefer dining in your room, order from the 24-hour room service.